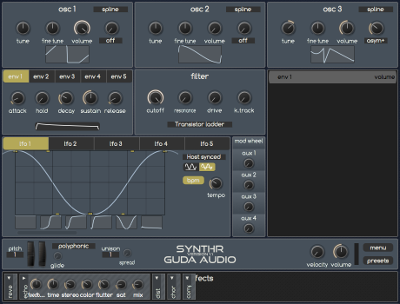 SynthR is a flexible synthesizer with drag and drop modulations, clean anti aliased oscillators and sweet saturated multi mode filter. It packs great effects and flexible LFO shapes. Use unison to create wide and fat sounds with up to 5 voices simultaneous at each note. Easy to change color themes and looks. 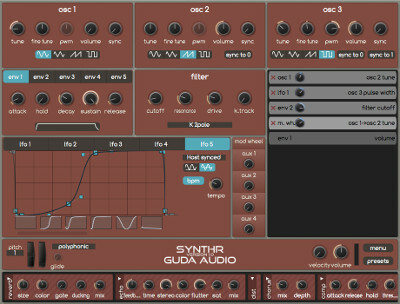 No separate download for full version, available in 64/32 bit for Mac OSX 10.7+ in VST/AU and Windows VST. 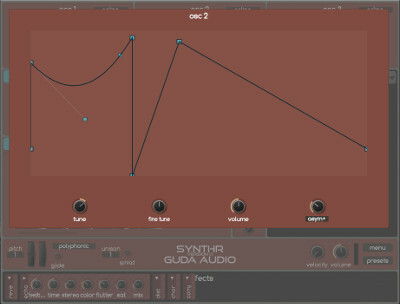 SynthR has two oscillator modes. "classic" with analog type shapes and "spline" with easy to use flexible waveform editor and shape morphing effects.